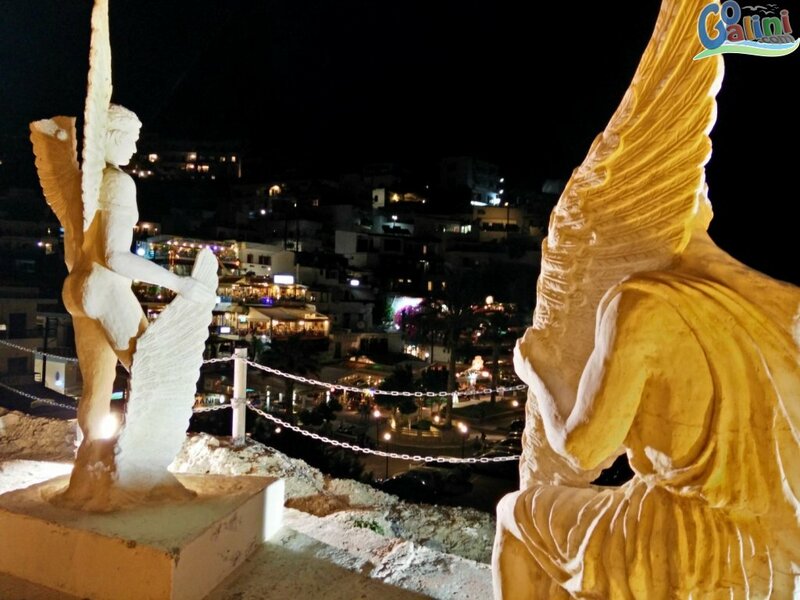 In Agia Galini is located the cave that Daedalus used to hide (according to the known myth), Daedalus was persecuted by King Minos, so he hid with his son Icarus until he gathered millions of feathers, and jars full of wax and honey. He mixed all of it together, all the while building frames of sturdy lumber. And when everything, the feathers, wood, honey, and wax, were compiled, there were two pairs of giant wings, big enough for men. The day he finished, Daidalos hooked one pair to his clumsy son Ikaros. He hugged the boy, and said, "Leave. Follow me from Krete. Don't go to high, or too low. Remember that my son. Remember." And once Daidalos had his wings, they both jumped from the cliffs. Up they flew, Daidalos steady and watching, Ikaros clumsy and swift. Ikaros felt pride, and began flapping higher and higher. Then the Sun proved Daidalos' warnings true. The wax and honey holding everything together melted in the growing heat, and everything crumbled. Ikaros fell, and Daidalos saw him fall. The boy seemed to fall so long Daidalos thought Ikaros was flying without wings. But the sea below caught up to Ikaros, enveloped him, and killed him.